At the Mews dental clinic, we will discuss the options available to you for the replacement of missing teeth. If as a result of a thorough assessment and discussion, the placement of an implant is your preferred option; we will refer you to a hand picked experienced specialist team, who will be able to provide you with the treatment of the highest calibre. If an implant has a screw thread on its outer surface it can be screwed into position and if it does not, it is usually tapped into place. 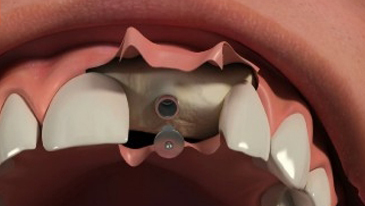 The main aim during installation of any implant is to achieve immediate close contact with the surrounding bone. This creates an initial stability, which over time is steadily enhanced by further growth of bone into microscopic roughnesses on the implant surface. In order to support replacement teeth, dental implants normally have some form of an internal screw thread or post space that allows a variety of components to be fitted. Once fitted, these components provide the foundation for long-term support of crowns, bridges or dentures.